In the autumn the production version of Citroen’s new C4 Cactus will arrive in the UK, looking uncannily like the Cactus concept car that pirouetted on a plinth at last autumn’s Frankfurt Motor Show – see below. Surprisingly, the squishy, rubberised “Airbump” cladding that seemed certain to disappear on the model’s journey to roadgoing reality has survived intact. The rubber even comes in four colours: grey, black, chocolate brown and “dune”, which is designer-speak for beige. 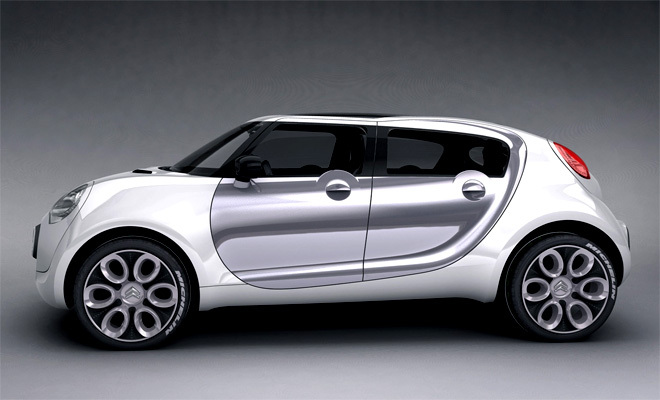 The new Citroen is compact – similar in size to Renault’s Captur – and extremely light. At just 965kg the leanest version of the C4 Cactus will be roughly 125kg lighter than the slimmest Captur, a saving of more than 10%. The pint-sized Volkswagen Up, by way of comparison, is two sizes smaller but weighs almost as much at 930kg. Weight reduction brings clear benefits in terms of fuel efficiency and typically also lends a car a more nimble and responsive feel. The C4 Cactus will be light on its toes partly due to the use of high-strength steels and partly due to the application of some admirable back-to-basics thinking. 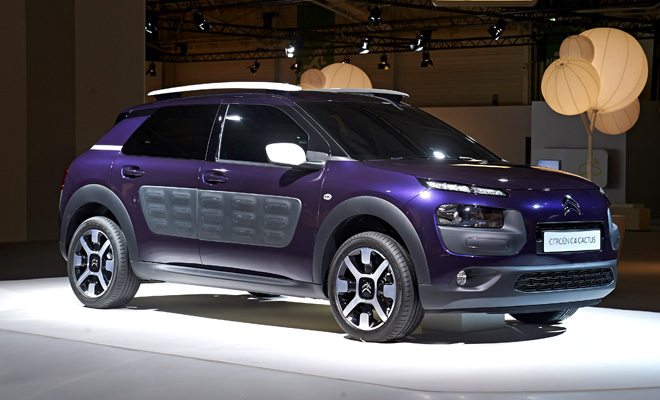 Cactus may go forward as a brand for Citroen’s crossover-style cars, just as Picasso applies to people-carriers, but the name first arose as a lean-and-green label. 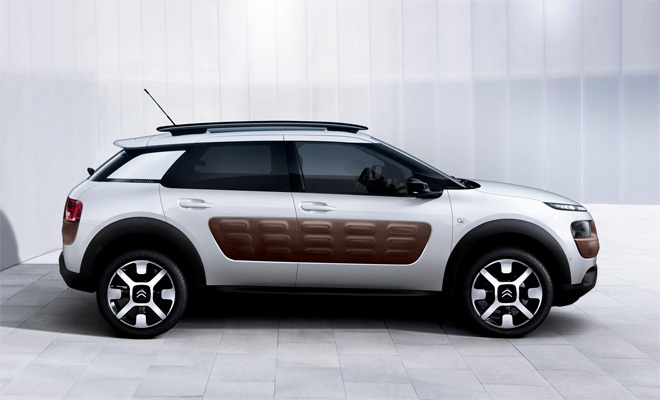 The original Citroen C-Cactus concept (above) cropped up at the Frankfurt show in 2007, taking its name from the spiky plants that manage to thrive despite modest resources. A diesel-electric hybrid, the bug-eyed prototype was designed to require about half the number of components needed to build a conventional vehicle. Essential items like doors where drastically simplified in construction, while non-essential items like the dashboard were re-examined, re-imagined or re-assigned to the scrap heap. The result was probably too extreme to become an actual product, but a whiff of the same thinking resurfaced in last year’s Cactus concept, and filtered through to this year’s production car. 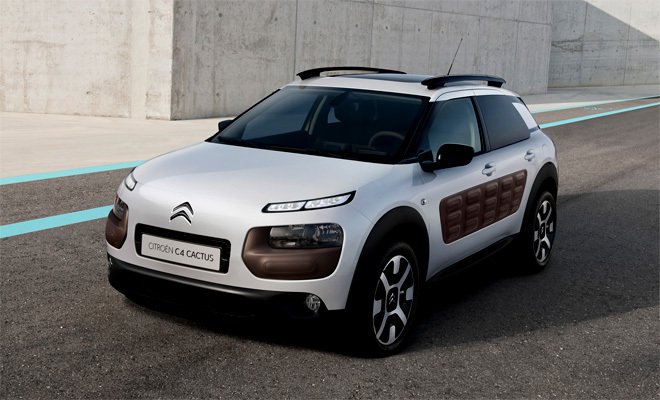 Which is why the C4 Cactus has pop-out rather than wind-down windows in the rear doors, for example. And an airbag that inflates down from the roof rather than up from the dashboard. 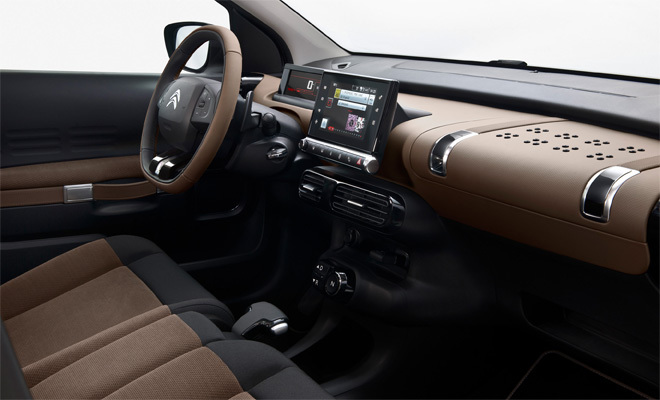 Under the C4 Cactus’s smooth, aluminium bonnet Citroen will install a range of light and compact engines, including Euro 6-compliant BlueHDI diesel engines and PureTech petrol powertrains. The diesel option will limbo as low as 82g/km on its CO2 tests, while the PureTech route will include a sub-100g/km option, according to Citroen. First seen in the existing C3 and DS3 ranges, the three-cylinder PureTech is currently produced in 1-litre or 1.2-litre editions, with power outputs of either 68bhp or 82bhp. In addition to small size and light weight, the PureTech menu includes various fuel-saving features such as stop-start, variable valve timing and on-demand battery charging. Other aspects of last year’s show car have also surprisingly made it through to the finished car, such as a bench-style front seat (in models equipped with an automatic transmission) and door-pulls modelled on the leather straps of posh luggage. Another notable aspect of the C4 Cactus is the relatively generous glass-to-body ratio, meaning you might actually be able to see out of the thing, and almost complete absence of muscular bulges, vicious slashes or aggressive, wedgy proportions. There’s a lot to like about the C4 Cactus, from what we know so far. Let’s hope it proves good to drive as well. Update: happily, it is good to drive. 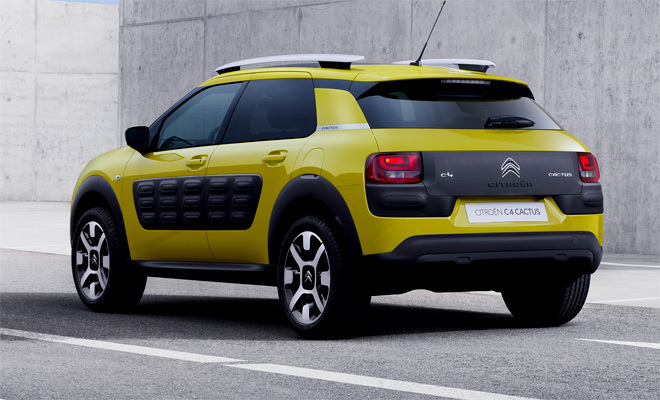 Read our C4 Cactus review.